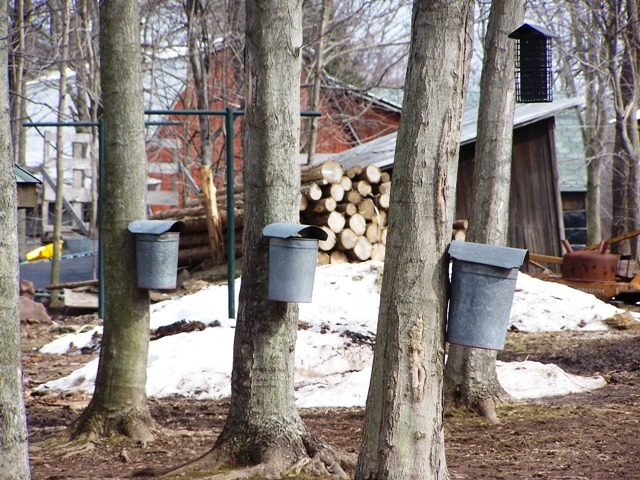 March 17 & 18, and March 24 & 25 Oswego County, N.Y. - Several maple producers will host tours from 10 a.m. to 4 p.m. Saturday and Sunday, March 17 and 18, and the following weekend, March 24 and 25, for the New York State Maple Producers Weekends. Red Schoolhouse Maple, 2437 county Route 4, Palermo, offers visitors the opportunity to see the latest technology in maple sap collection and syrup-making. They will offer ‘all you can eat&apos; pancakes and sausage, along with snowshoeing/walking tours of the sugar bush, sled dog demonstrations, coloring contests, and tours of the maple production process. Free samples of maple syrup, maple cream and maple cotton candy will be available along with other refreshments. For more information call 315-243-1024 or visit http://www.redschoolhousemaple.com/ Maple Hollow Farms, 1309 county Route 85, Hannibal, will offer guided tours with samples of fresh maple syrup and three flavors of maple cream. Visitors will have the chance to meet the Oswego County Maple Queen and Princess. A variety of farm animals, including Emma, the Oswego County Fair Supreme Champion milking brown Swiss cow, will be on hand. Visitors will learn techniques of tapping trees, how to measure the sugar content in the sap, and explore the different collection methods used on the farm. For information call 315-564-7133. Maple Hill Farm, located at 86 Guernsey Road, Hannibal, will host tours on both weekends as well. Their tour will include a walk of the sugar bush, syrup making and bottling process in the sugar house. The farm has been in operation since 2001. Visitors should dress for the weather and bring their mud boots. For information call 315-593-2396. New York State Maple Weekends began nearly 17 years ago in Wyoming County as "maple Sunday." The event has grown to a state-wide celebration of the maple sugaring process. For more details about "maple weekend go to http://www.mapleweekend.com/. For visitor information and upcoming events, visit the Oswego County Tourism website at http://www.visitoswegocounty.com/ or call 315-349-8322.